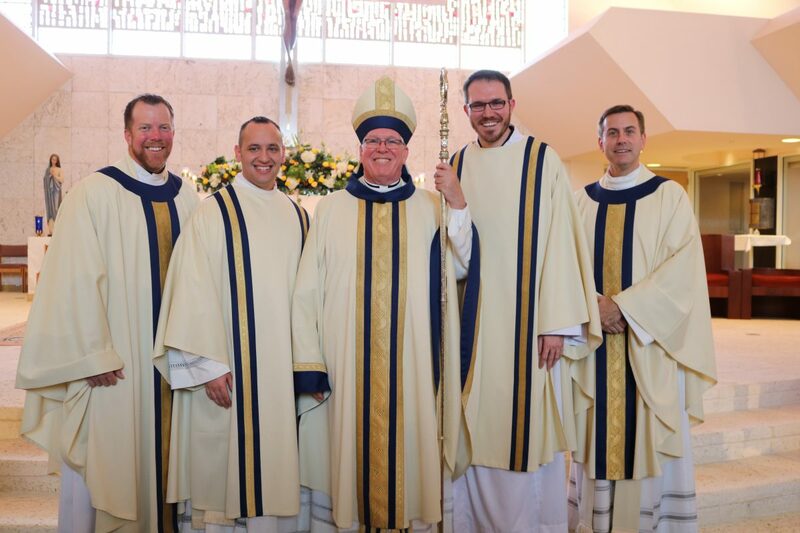 BOCA RATON | As song and prayer filled the church of St. Joan of Arc in Boca Raton, 15 men laid prostrate, laying down their lives before the altar of Jesus Christ. 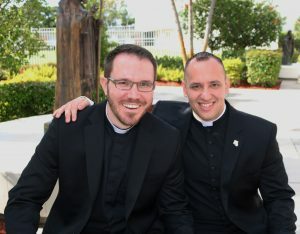 The Ordination to the transitional diaconate, which took place on Saturday, April 6, is the next step to the priesthood for these men, including Adam Marchese and Thomas Pringle, seminarians for the Diocese of Orlando. For Marchese, the impact of the day struck him right away. An especially moving moment for Pringle came when Bishop Frank Dewane of the Diocese of Venice laid hands on each of the seminarians, invoking the Holy Spirit to come down on those being ordained. For Pringle it was the culmination of a six-year journey with his classmates, who had become brothers. Over the next year, the new deacons will continue to prepare for the priesthood as they serve at local parishes. They will proclaim the Gospel, preach and teach in the name of the Church, preside at baptisms, witness marriages and provide comfort for those who mourn at funeral services. In his homily, Bishop Dewane reminded these men that while these ministries are incredibly important, their vocation is more than the work they will do.